Who’s not aware of the Vincent Van Gogh’s artwork? All the vibrant, moving and dramatic paintings from the past belong to him. That is the reason why we are going to feature some of the amazing tattoos inspired from his paintings in our today’s article. The artwork from the Vincent Van Gogh is known for centuries to all across the world and his artwork is not less than a blessing to our contemporary art and designs. He was the Dutch Post- Impressionist painter and is counted among the most influential personalities of the past. Although his massive collection includes over 2,100 artworks, but, he was considered to be a victim of mental illness, frustration, and despair. His life was thought to be struggling in all these elements, yet he was depicted as world rich in art and poetry. 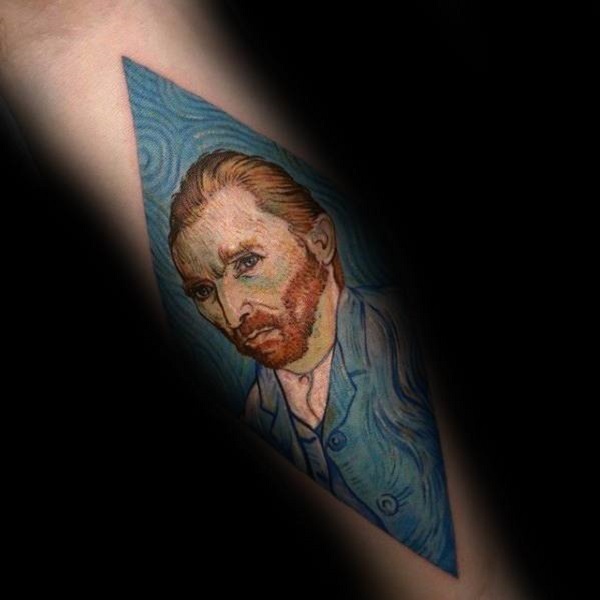 You might be wondering what does the Vincent Van Gogh has to do with the tattoos? Well, his artwork including oil paintings a, portraits and brushwork are so adorable that they provide an awesome foundation to the tattoos. And that is the reason why we are here. If you are one of the admirers of the art and poetry, you do need to check the following pieces by Vincent Van Gogh inked by other artists. Grab your popcorn, sit back and check some of the most amazing artwork of Vincent Van Gogh as tattoos and thank me later! Starry Night Portrait on Inner Arm. 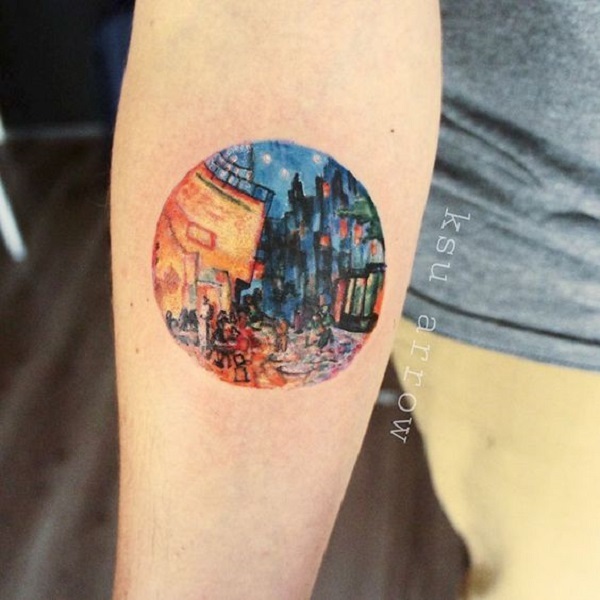 Satrry night is considered to be the most popular painting of the Vincent Van Gogh and that is the reason, it is inked in a number of tattoos by several artists using their own creativity and colors. Starry Night Tattoo on the Back. The popularity of the Starry night painting by Vincent Van Gogh was due to its amazing swirls, composition and the use of colors. You can see the similar magic in the tattoo above. A Pot of Sunflowers by Vincent Van Gogh. Another popular artwork by Gogh was the vase with 15 sunflowers. This painting, although very typical, but got rave reviews from the people, because of its lush brushstrokes and the spectrum of yellow blossoms. City Meets the Starry Night. As mentioned earlier, starry night is inked in various styles, by variety of artists. So this one gives the scene of starry night over the city. The tattoo uses the same color scheme, but offers a bit different scenario. 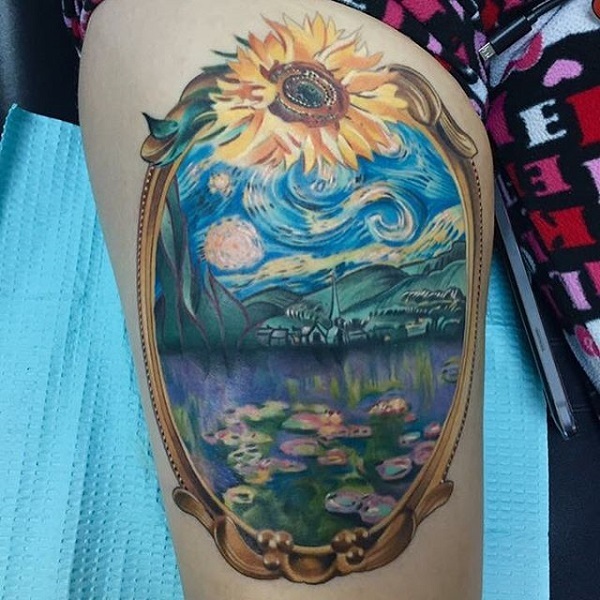 Sunflower Mirror Reflecting Starry Night Tattoo. 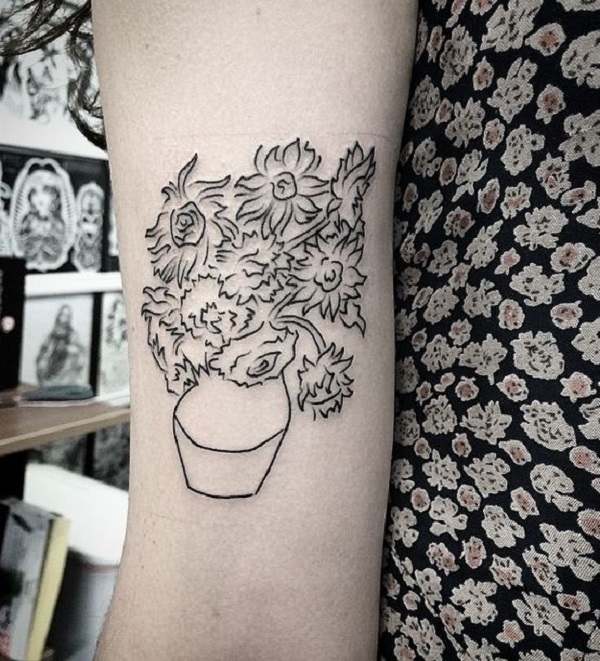 If you are a true fan of Van Gogh, then this tattoo would be your choice as it offers the combo of his two popular artworks – the Starry Night and the fifteen sunflowers. 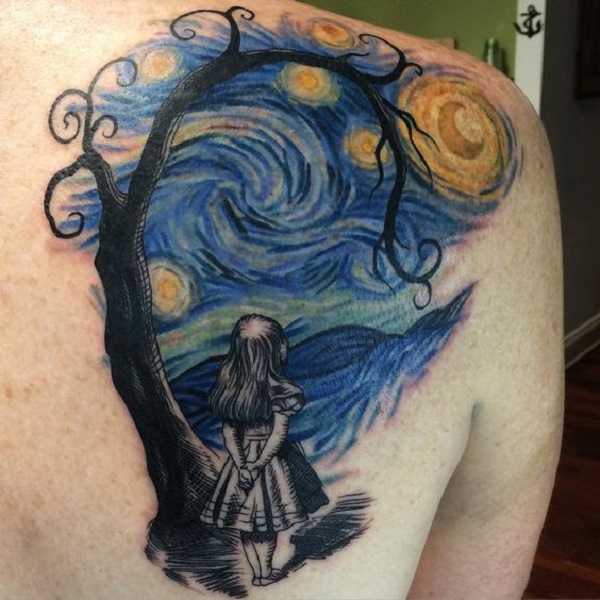 Lonely Girl in Starry Night Tattoo. This combo of starry night with the lonely girl is awesome. The girl depicts the lonliness under the deep blue sky with the stars. The artist might be depicting Van Gogh under his own artwork. A Cafe Terrace at Night Tattoo by KSU Arrow. Among the number of paintings by Vincent Van Gogh, this Cafe Terrace at night was the one that was equally admired by the people. This This tattoo is the great example of the artist’s imagination and superb dealing with the light. Vincent Van Gogh Portrait with Sunflowers. Van Gogh also made his own portrait using his imagination and colors. He painted over 30 self portraits within an year. He used his portraits to improve his skills and to make money. These different portraits are also used as tattoos all across the globe. A Starry Night Vincent Gogh Portrait. Gogh experimented his portraits with the flowers and landscapes. But he didn’t experimented it with the starry night. 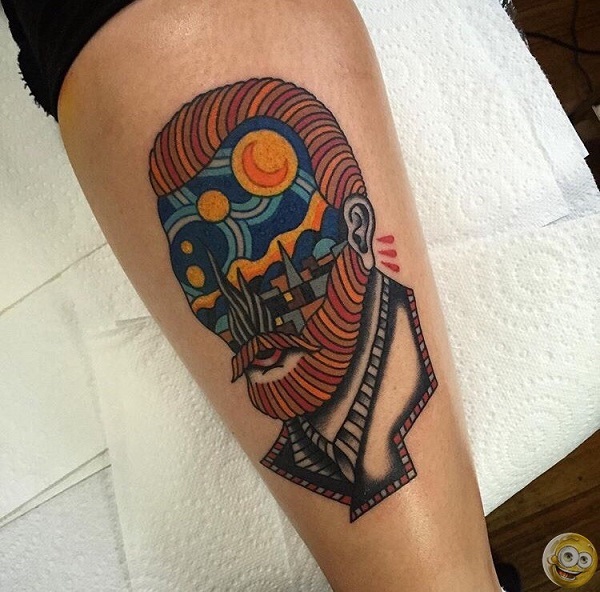 So this tattoo artist used his creativity and inked a Gogh’s portrait with the starry night. Starry Night Puzzle Piece. This piece of puzzle might is reflecting the mystery hidden behind the Starry night. If you are looking for some tiny piece of tattoo with the Van’s inspiration, here’s what you can have. A Great Starry Night Portrait. Another Vincent’s portrait with the starry night. The use of colors, combinations and the creativity makes this tattoo a sight worth watching. 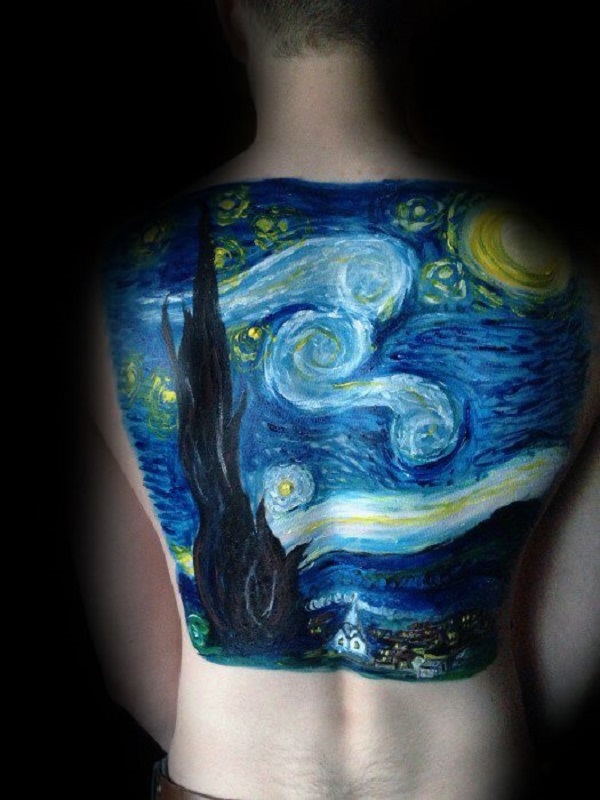 The Starry Night Full Back Piece. As per my research, it was thought that the starry night painting depicted the view from Van Gogh’s asylum. He was admitted to asylum after he removed his year. A Road with Cypress Tattoo Design. Cypress tree is the common object seen in most of the Gogh’s tattoo. The mystery behind this is still not solved, but, the cypress element do makes his artwork popular and mysterious. 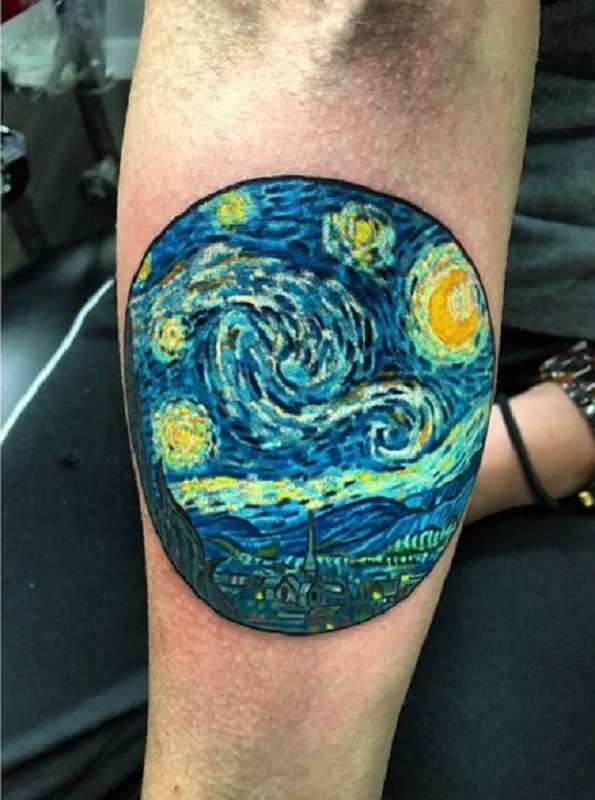 The Black and White Starry Night Tattoo by Goldy-Z. This tattoo by Goldy-Z is a great depiction of creativity and imagination at the same time. 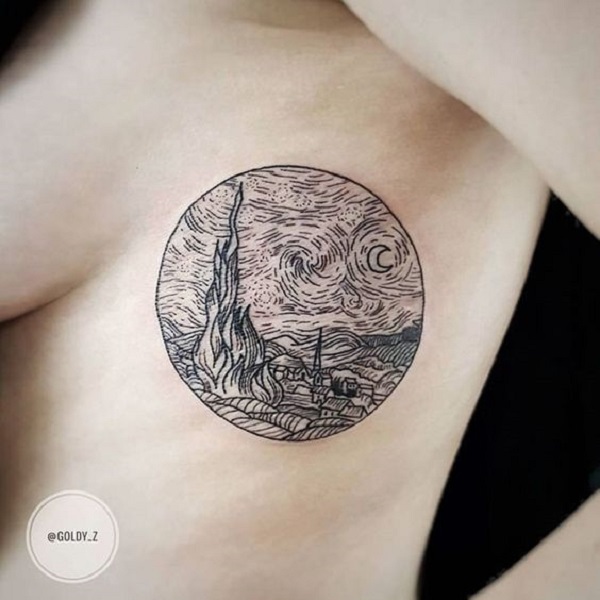 The colorless starry night with just black lines makes a great tattoo. 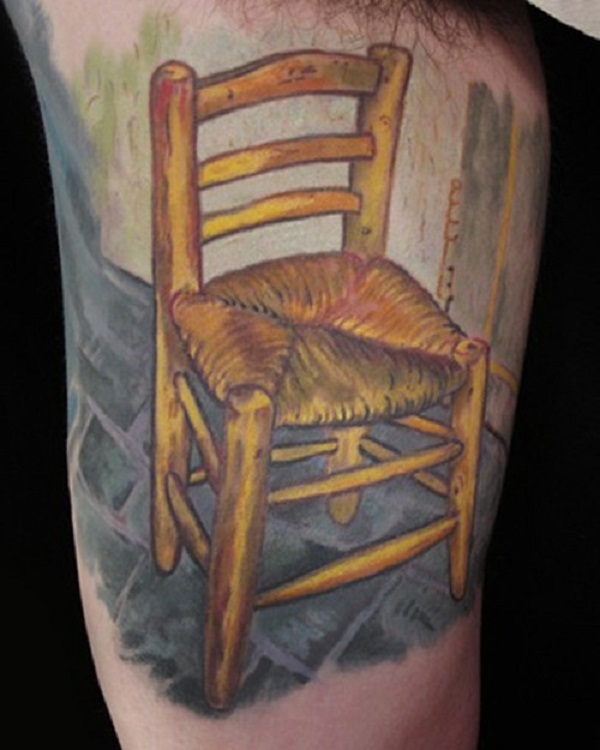 Van Gogh’s Chair Painting Tattoo. The chair paintings of the Vincent was counted among the most analyzed work of his own. His chair painting was displayed along with the Gauguin’s chair painting that were offering a complete different chair picture. According to the research over these two chair paintings, it was revealed that Van’s chair executed in light color depicting daylight while Gauguin’s chair was executed in the darker colors, depicting night. 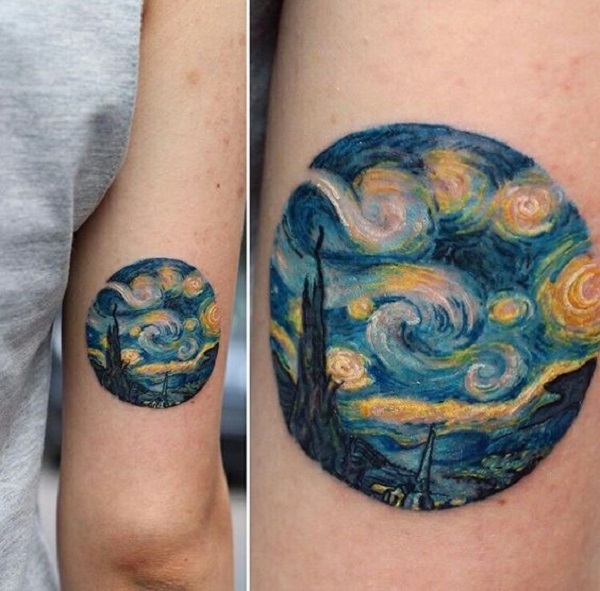 The Elegant Looking Starry Night Tattoo. Another look to the creativity. The Starry night here looks elegant with the gold moon shining above. Another Starry Night Tattoo with Cypress and the City. It is thought that the starry night might be about the mortality as the cypress tree mostly depicts the death while the stars depicts the people shining after the death. A Gaze at Starry Night. 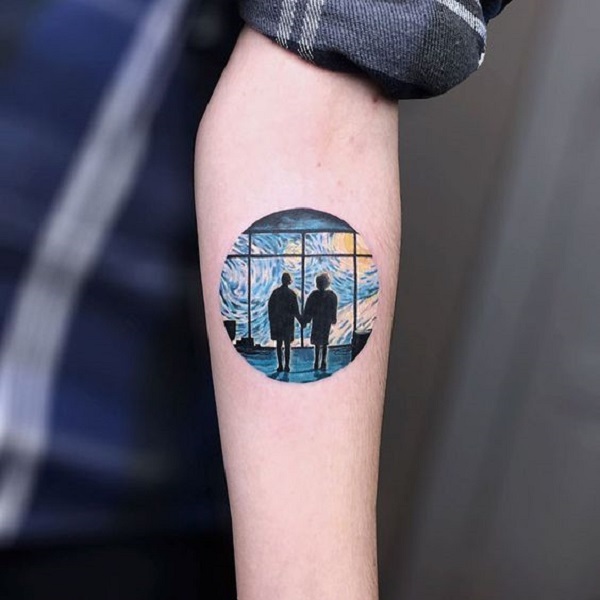 Here, a couple holding hands is gazing out of the window over the starry night. Here the couple might be Van Gogh with his wife. The tattoo is very imaginative and might be depicting the immortal love. Starry Night Tattoo for Her. Starry Night tattoo is equally popular among both men and women. Moreover, it is placed on every part of the body ranging from the back to the arms, from hand to the calf. 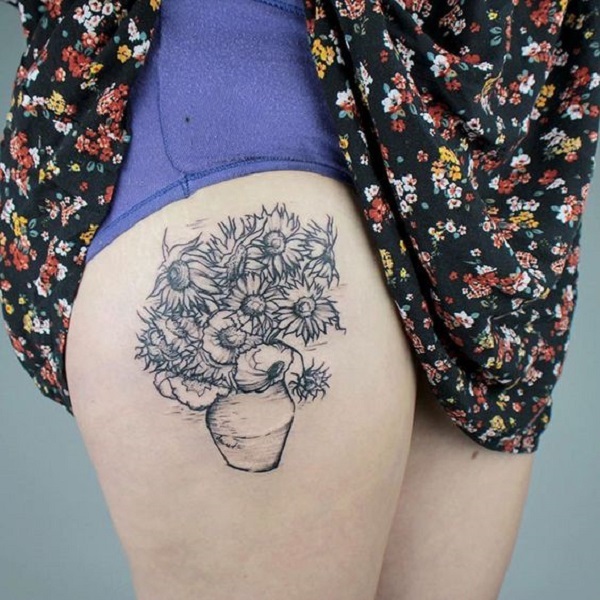 The wide placement choices for this tattoo might be the reason for its popularity. Starry Night within the Heart. 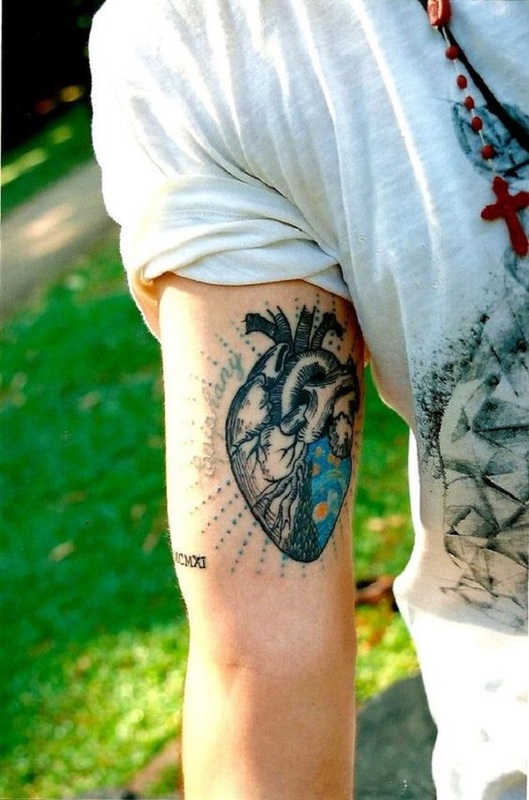 This tattoo also reminds us the starry night within the heart minus the flower stalks. 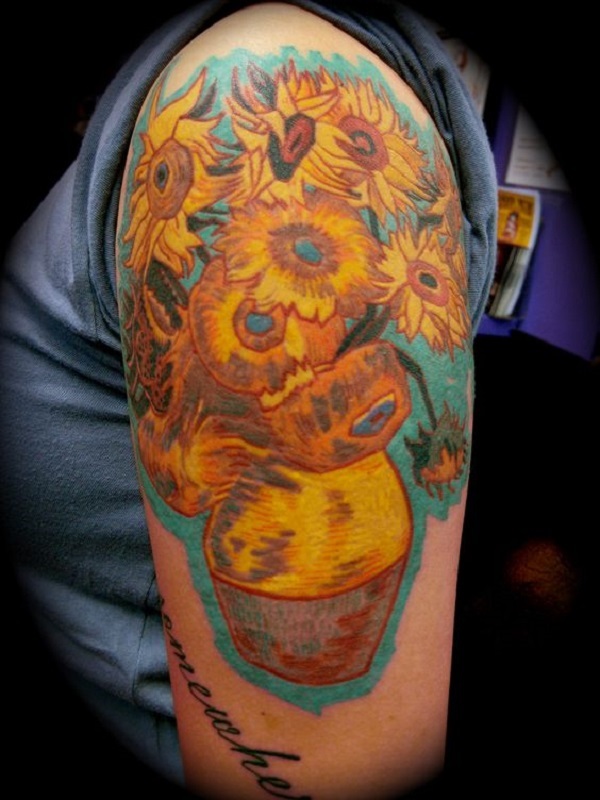 Sketched Vase of Sunflowers Tattoo. 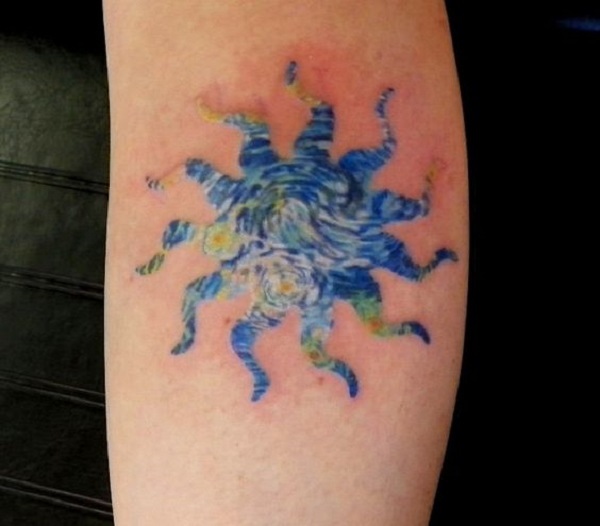 Another amazing tattoo inspired by the artwork of Vincent Van Gogh. Artist gave this artwork some twist with the sketching effect. Sunflowers within the Starry Night. Another amazing combo of Starry night with the sunflowers is next on the list. A City under the Starry Night. This one is the magnified tattoo inspired by the Starry night. Amazing details and amazing swirls just like the artwork presented by Van Gogh. 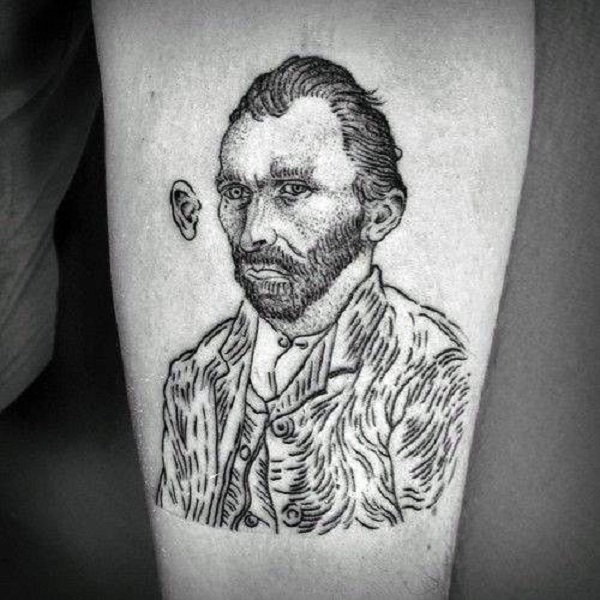 Sketched Van Gogh’s Tattoo with his Ear Removed. Van Gogh was admitted to the mental asylum as he removed his ear. It was thought that Van was mentally impaired and despaired. 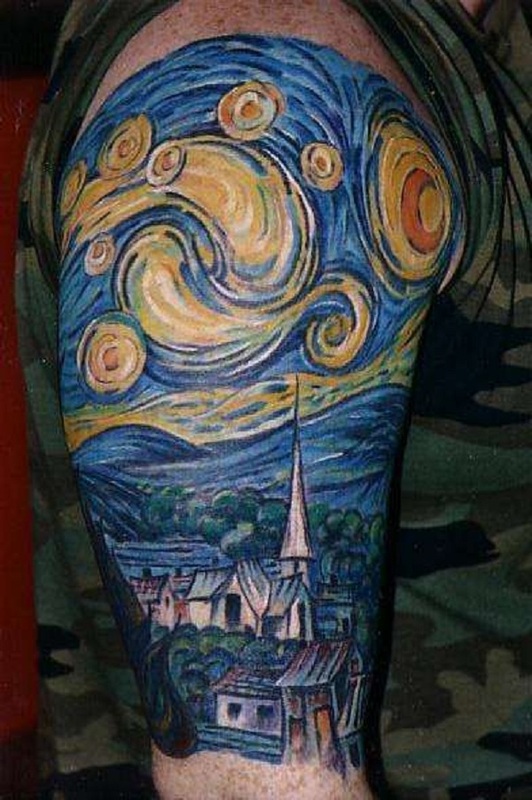 Starry Night Sleeve Tattoo. 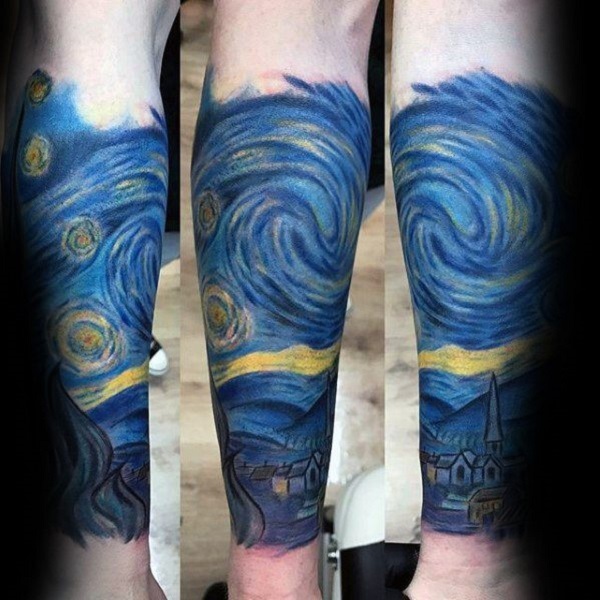 For the Can Gogh’s enthusiast, this sleeve tattoo inspired by the starry night is worth giving a shot. The Element of Starry Night. 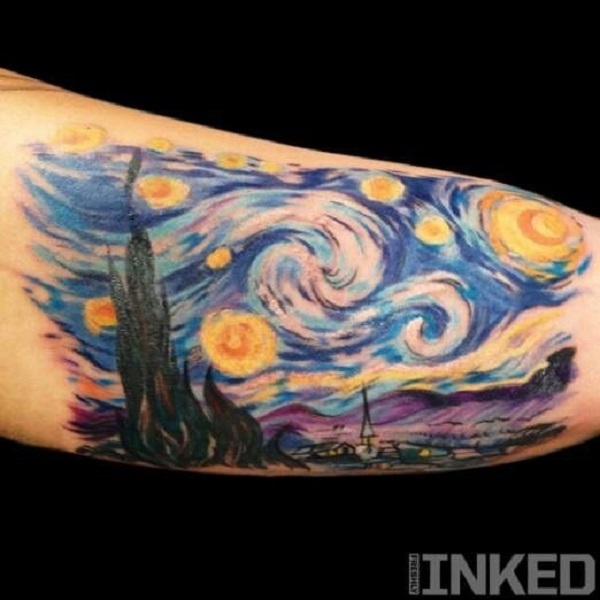 This element of starry night is another amazing idea for Vincent Van Gogh artwork tattoo. Vincent Van Gogh’s Self-Portrait. If you want something gentle yet effective, this self- portrait of himself is a great choice. Starry Night Piece. 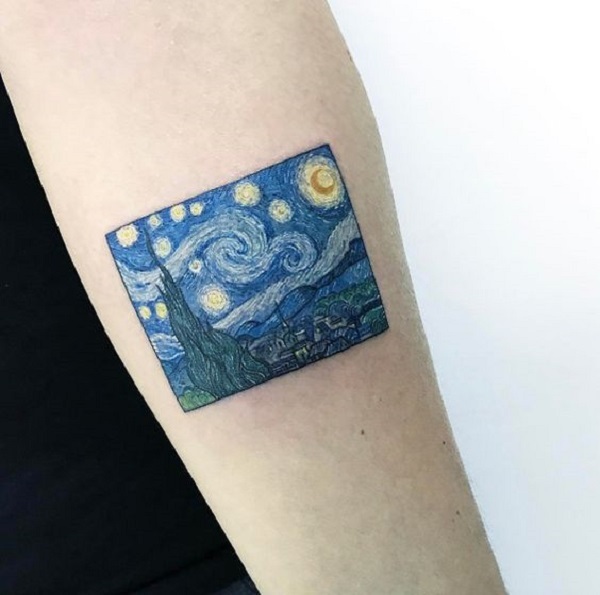 Although Van Gogh considered Starry night a failure, but, this tattoo inspired by his artwork is a complete new look portraying the same idea of starry night. A Starry Night Circle. a Circle means no end. 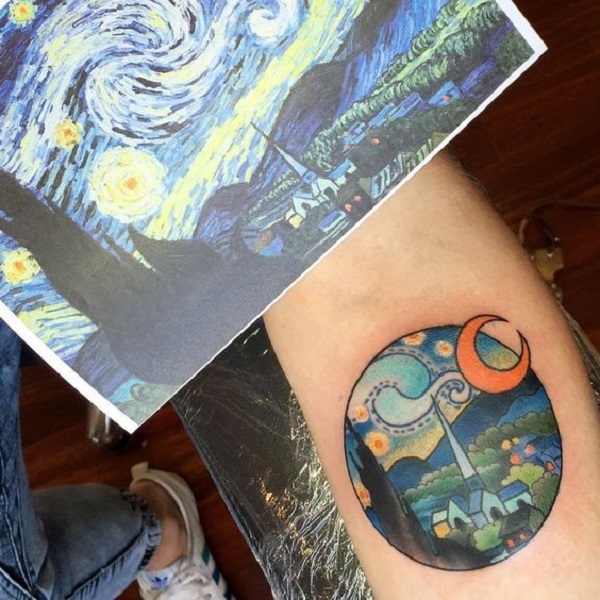 This starry night tattoo might be depicting the never ending cycle of starry night. Sunflower Out From a Vase by Pete Zebley. 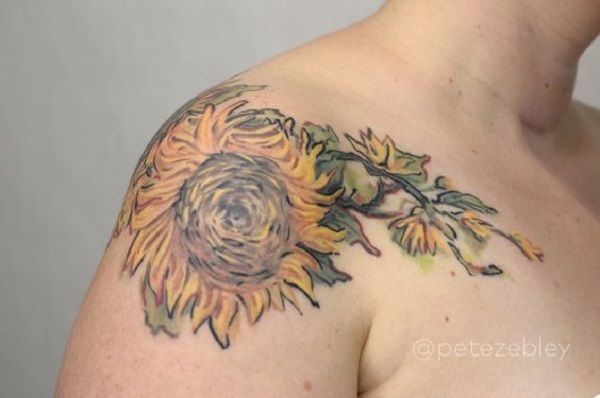 Pete Zebley creatively used the element from the Van Gogh’s tattoo and inked it with her imagination and details. The Thunder of Starry Night. With thunder magnified, this one also makes the great starry night tattoo to be inked. Starry Night within a Mirror. This tattoo is for all those people who have been fond of artwork by Vincent Van Gogh. 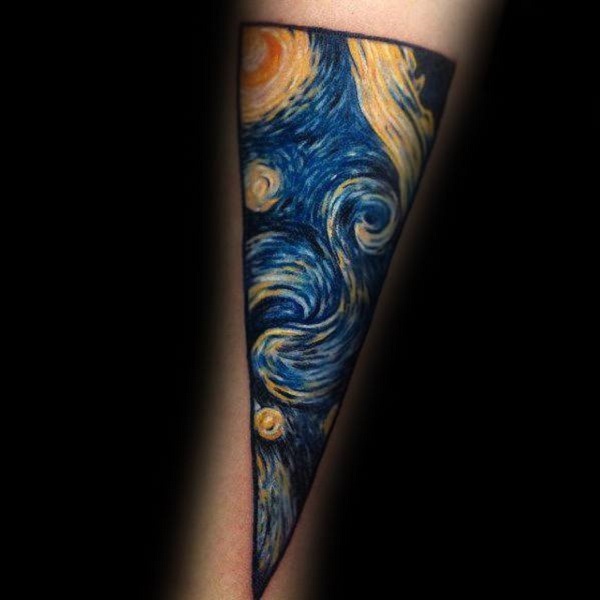 The Starry Night Sleeve Tattoo. The serene wide image of the sky on the bicep offers a complete different vibe. 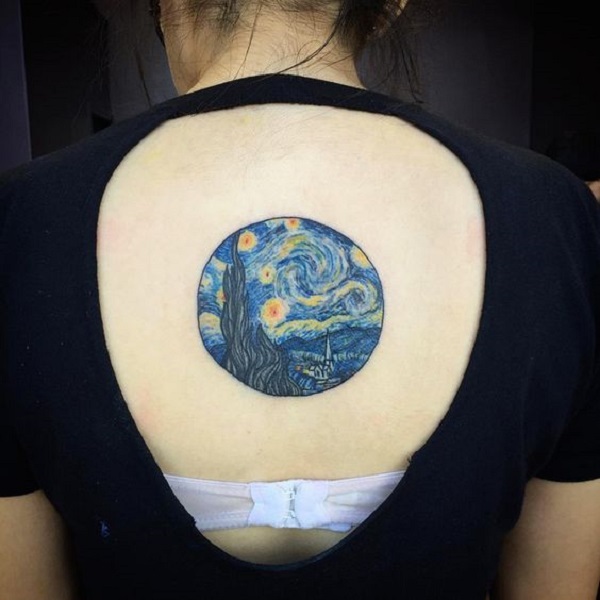 Another Creative Starry Night Tattoo. If you are looking for something creative yet unique, this magical piece of starry night is definitely made for you. Starry Night within a Heart. 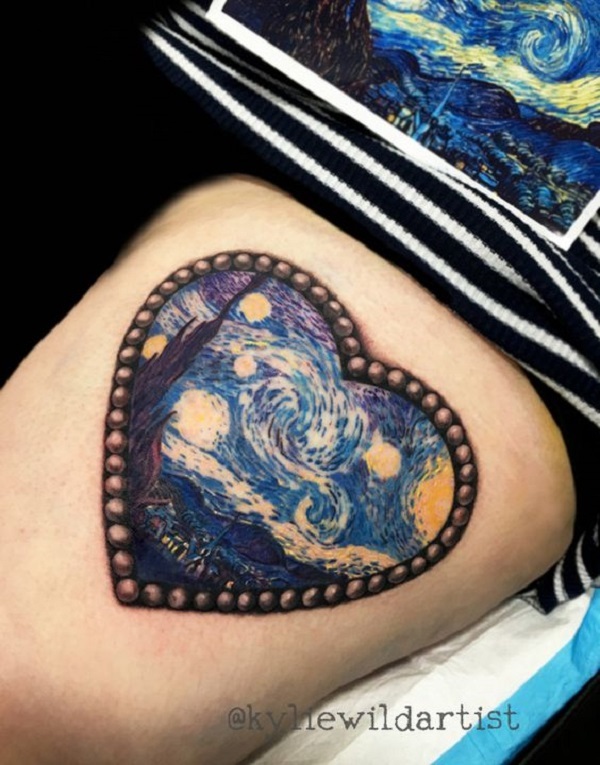 Heart tattoo combined with the starry night is amazing idea to show your love for Gogh’s artwork. Irises Tattoo. Along with the starry night, sunflowers, chair, irises is another amazing artwork by Van Gogh that speaks for his creativity. 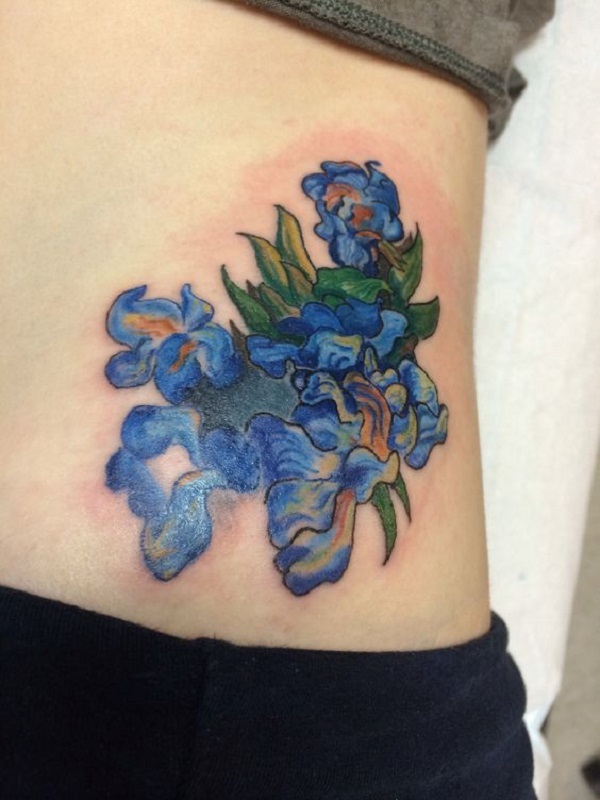 The tattoo inspired by Gogh’s irises offers amazing colors and love for the art. Heart Tattoo with a patch of Starry Night. If you want something amazing with something simple, go for this amazing heart tattoo with the starry night patch carved over it. A Deep Starry Night Tattoo. 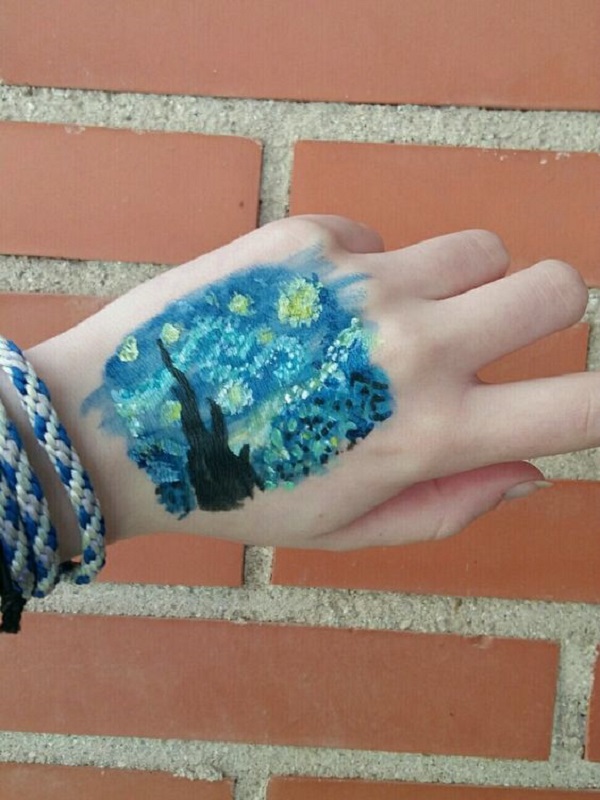 This unique yet stylish starry night tattoo will speak for your preferences and choices itself. 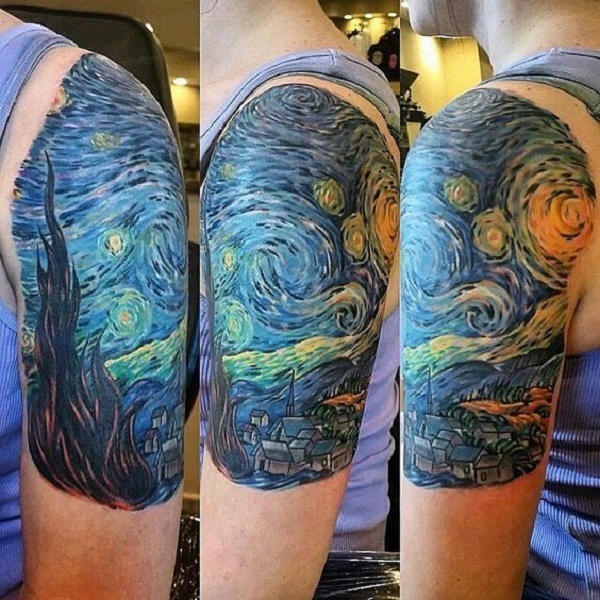 The Detailed Starry Night Tattoo. The fine lines, the amazing brushstrokes and the color combinations all together, making this tattoo a complete payoff. Another Great Piece. 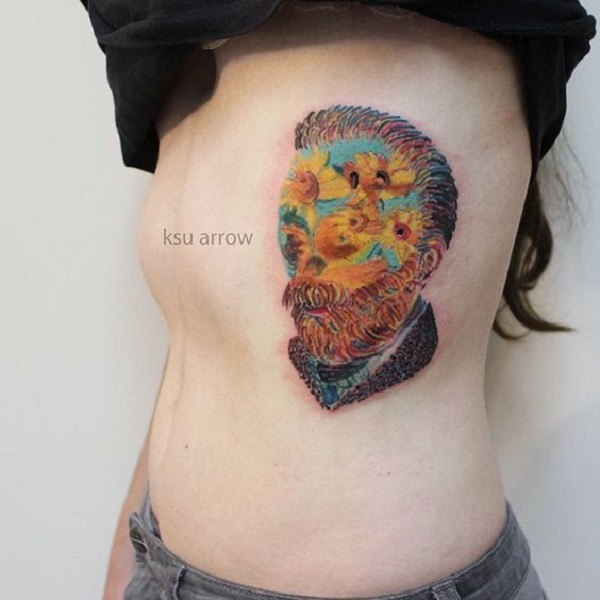 With the vibrant colors and amazing texture, this tattoo inspired by the Van Gogh’s artwork is worth a shot. A Starry Night Patch. 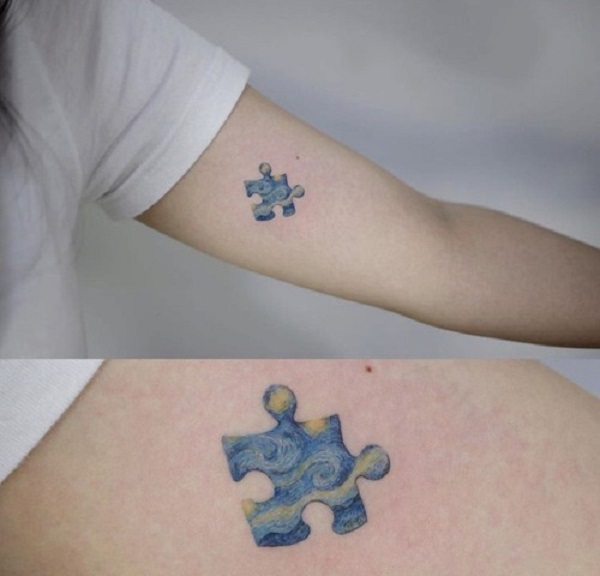 If you are looking to get a tiny piece of tattoo inspired by Van Gogh’s artwork, this tattoo is the best thing that you can have. 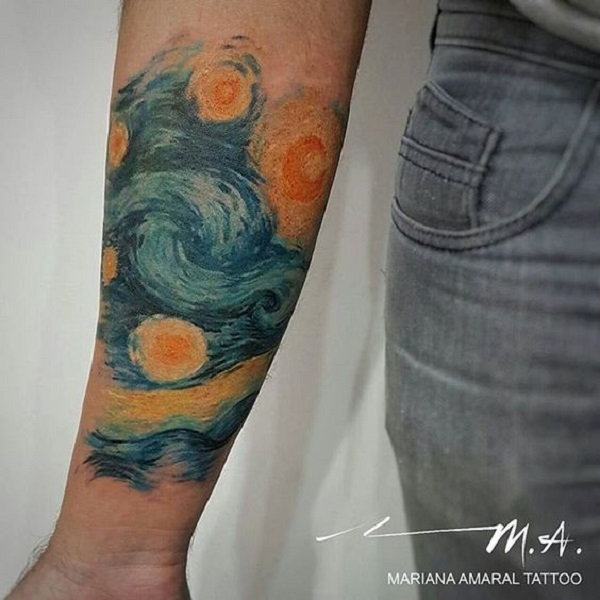 Creative Starry Night by Mariana Amaral Tattoo. The faded colors but the striking view of the starry night by Mariana Amaral also makes a great option to try on. The Cypress and the Starry Night. If you are a great admirer of the art and Vincent Van Gogh, you might be missing this amazing piece. A Vase with 15 Sunflowers. The bright colors and amazing creativity, this vase of 15 sunflowers is worth trying for all the art lovers. Starry Night in New York City by INKED. 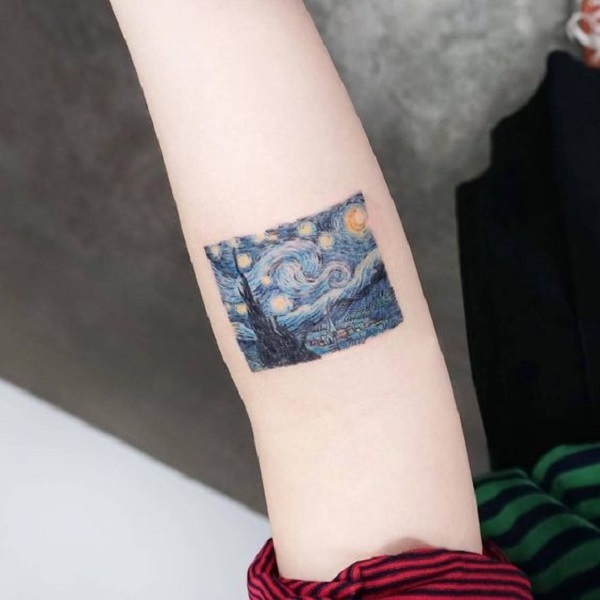 This starry night tattoo is place on the forearm and I think, forearm is the best placement to ink the starry night art. Make your body a canvass for the classic artwork by Vincent Van Gogh and recreate the magical spell once again with the coloring ink and creativity of your own.